Electricity access: whats the big deal? Around the world about 1.3 billion people still live without electricity. Most of this population resides in the developing parts of the world. Out of this 1.3 billion about 84% live in rural areas (IEA,2011). We have all seen and heard these numbers several times. The lack of electricity access is being seen as a problem, an issue that needs to be tackled seriously. But what is the big deal? What if some people do not have electricity access? What difference does it make? They still survive. They have other forms of energy like biomass. Rural population in some countries have always moulded their daily life according to sun. They go to bed early and they rise early. So, why make electricity a big deal. Clearly, the stress is on health, education and economic development. However, in September 2000, the Millennium Development Goals (MDGs) emerged through the United Nations Millennium Declaration(UN,2000). These set new parameters by including eradication of extreme poverty, universal primary education, gender equality and women empowerment, reduction of child mortality, improvement of maternal health, combating major diseases and ensuring environmental sustainability. Again economic development, social development and health were under the spotlight. This was about development goals, but how are these related to electricity. Well, it is noteworthy that this 1.4 billion population resides in the world's poorest regions, namely Sub-Saharan Africa and Developing Asia. 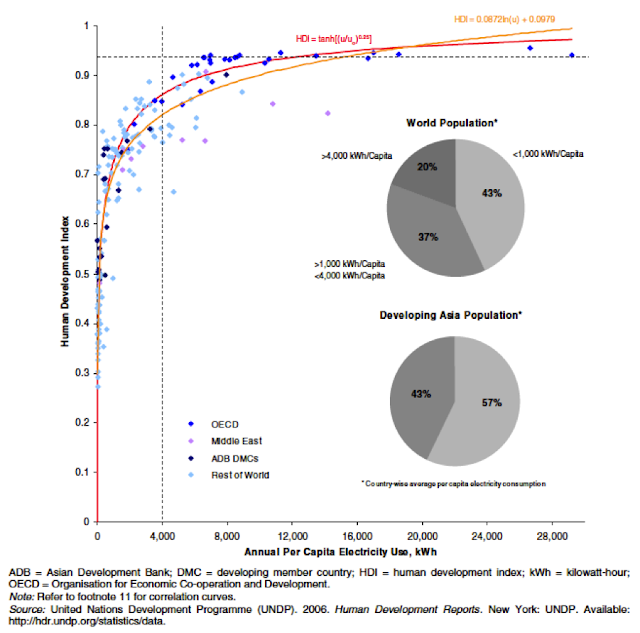 Also is noteworthy the connection between HDI (Human Development Index) and per capita electricity use, as shown in the figure below. Does this signal a connection, a nexus between electricity and development? Well it may be so. The combination of the trends above with the discussion on HDI and MDGs may give us some indication of the importance of electricity and electricity access for holistic development.